While en route to Seattle to begin its cross-country trip to raise awareness and funds for the Fuller Center for Housing’s fight against poverty housing, the Fuller Center Bike Adventure team’s van and trailer crashed in Burley, Idaho, on June 7. Donors quickly stepped forward to help the team purchase a replacement van, and New Horizons Habitat for Humanity led an effort to replace the trailer. 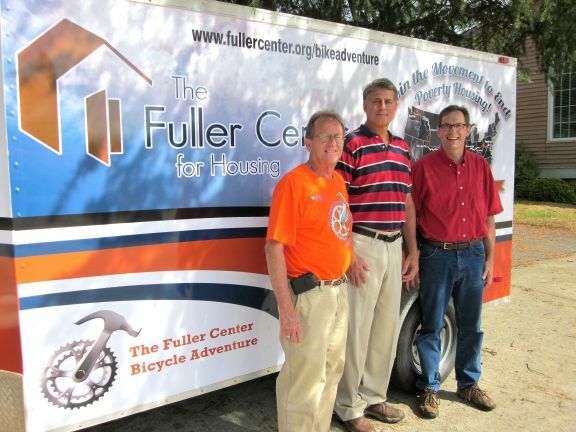 On Wednesday, New Horizons Executive Director Joel Kellam officially presented the Fuller Center with the finished trailer, fresh with new artwork promoting the Adventure’s mission. In addition to New Horizons, others stepped forward to help secure the trailer for the Fuller Center, including Cliff Sizemore and Darrie Hart of Ameri-Green Environmental Recycling LLC; Robert Littlejohn of Johnny’s Sheds; Johnny Shiver of Shiver Lumber Company; Lee Pinnell of Clinic Drug Store; and Dr. Wallace Mays. “All of the above were quick to react and lend a helping hand, and we are all thankful there were no serious injuries,” Kellam said. Snell and his wife, Sheilla, are now en route to Colorado Springs, Colo., where they will leave the trailer for the Bike Adventure team to pick up on July 11 during its ride through Colorado.